What If the Star Wars Cantina Song Had Lyrics? The Star Wars Cantina song was a lot better without lyrics I think. It’s campy enough within the original film without having any lyrics to muddy it up, almost like a jumpy, upbeat version of the music you might hear in a piano bar. In the original movie it’s true that the droids weren’t allowed in but quite honestly it’s almost like not letting a pet in at times despite the fact that droids are sentient and don’t tend to make a mess unless they’re just too clumsy or perhaps suffer from a bad motivator or something similar. In other words they are treated like second-class citizens for the most part. Also, the Cantina is a very dangerous place indeed. If a person can get their arm cut off and another person can be shot and no one raises a fuss then you know it’s a rough joint. One interesting story about Greedo getting shot however is that afterwards the bartender took his body and processed it into a fine powder that he then added to some of the drinks to flavor them with. That sounds absolutely gross but think about it this way, it’s a big galaxy and everyone has their different tastes. For poor Greedo it was just adding insult to fatal injury. But that’s the Cantina, things happen all the time and those that frequent the place don’t much care since it’s commonplace and none of their business unless it’s happening to them. This is an interesting question to ask in regards to the music in the movie, but really listening to it made me glad that no one bothered to add lyrics to it from the beginning or in the edited version. The scene in Jabba’s palace got weird enough in Return of the Jedi that a lot of people were turned off to it almost immediately. As a fan, not a fanboy, I happened to have liked some of the new edits but some seemed kind of unnecessary. The Cantina didn’t get a whole lot of edits which was nice, as it left the scenes in A New Hope alone for the most part and didn’t bother to really go into that much more detail. Sometimes it’s the details you leave out of something that make it more agreeable to those watching, reading, or listening. Putting in a lot of details can just clutter the whole thing up eventually and make it less than what it was before. It sounds odd to think that you can have more and still have less but it’s very true in terms of music and movies. The more you put in the less people might want to watch it since it becomes too much to take in all at once and tends to be a little too overbearing. 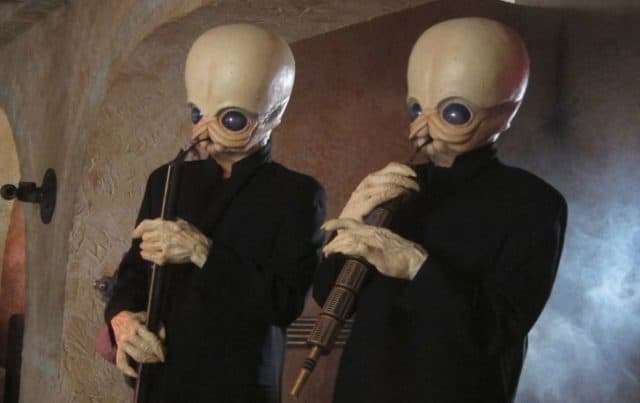 Besides, the Cantina song was just fine as it was. There weren’t any lyrics for a good reason I’m guessing and part of it could have been that the were only meant to be a background band and nothing more.